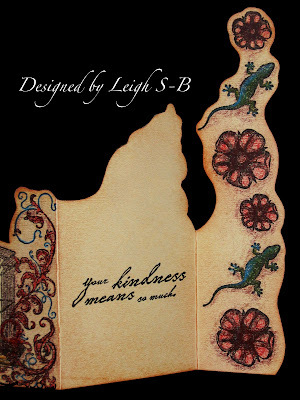 Velvet Paw Creations: Get your Skinny on with my unique tri-fold card featuring Blockheads newest stamp collection! Get your Skinny on with my unique tri-fold card featuring Blockheads newest stamp collection! I've got a super fun tutorial for you today! I have a stamping style I like to call 'Unique and Skinny'. So here's the 'skinny' on how to create tri-fold cards that are 100% unique coz their shape is based on the images you use. 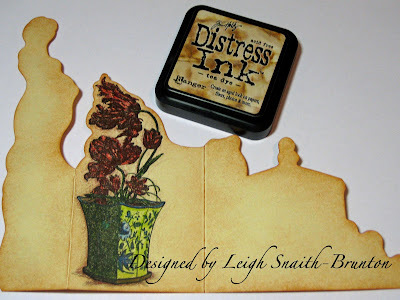 For this tutorial I'm featuring one of the newest stamp collections available from Blockheads Paper Arts called Victorian Eccentricities and two sentiments from the Painted Butterflies set. Both sets are simply gorgeous and you can get your hands on the full sets and the individual images unmounted or cut on cling cushion. 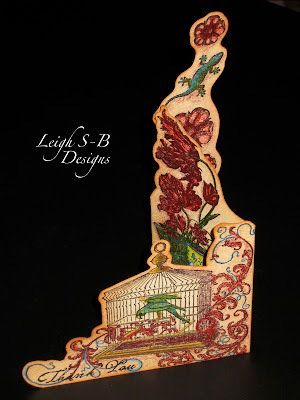 The images from the Victorian Eccentricities collection carry me away to far off lands on the Indian Ocean and hot summer nights of tropical British Colonial Victorian homes in India or Africa. 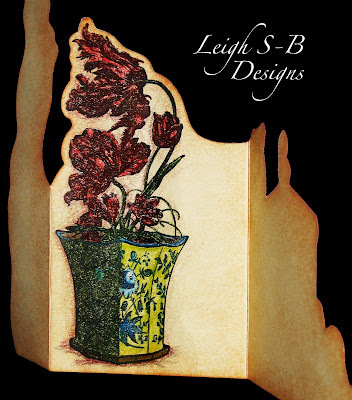 My card design has the rich warmth typical of a Colonial colour palette consisting of dark woods, deep red, green, blue and gold. 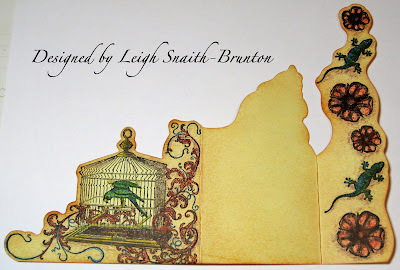 I used PrismaColor pencils and Tea Dye Distress Ink to achieve this look and the way I cut my card to follow the stamped designs, getting narrower and taller as I progressed through each fold, creates a super skinny card that is truly unique! 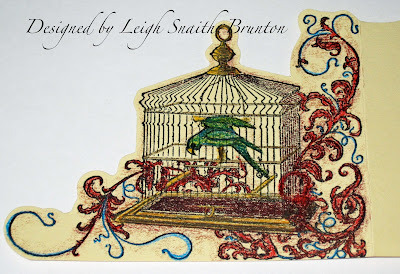 Stamp the Flourish Bird Cage in Versafine Onyx Black ink onto the bottom left hand side of a sheet of cream cardstock and score a fold line right up against the right hand side of the image. 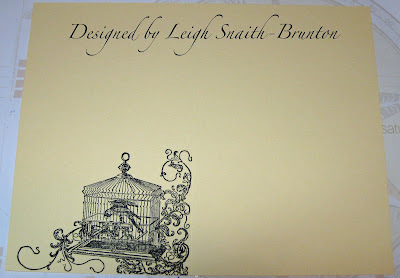 Fold along the score line and cut away the excess cardstock by closely following the outline of the stamped image. Stop cutting once you reach the fold. 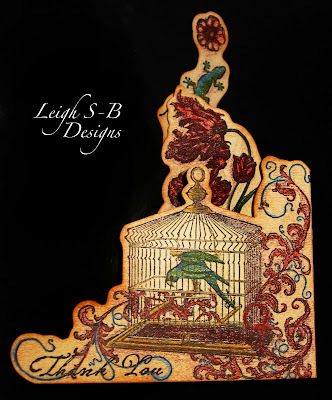 Turn the cardstock over and stamp the Tulip Vase left of center so that when the first panel is folded in front the placement of the Vase lines up with the right hand side of the bird cage. 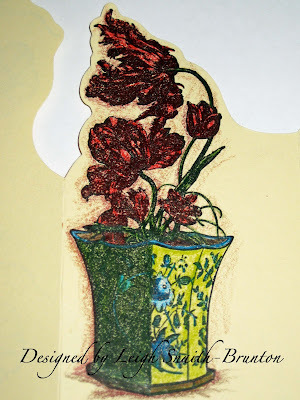 Score a second fold line on the left of the Vase and continue trimming away the excess cardstock by following the outline of the flowers. Stop when you get to the fold. 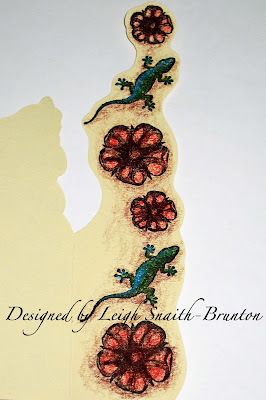 Assemble the small and large Blossoms and Gecko stamps together on an acrylic block so they form one design. 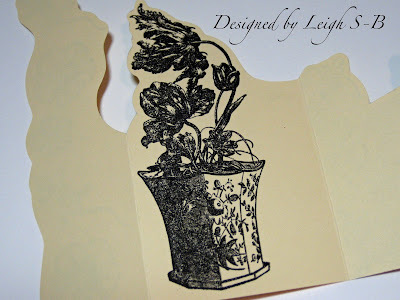 Stamp the design twice on the third panel and cut away the remainder of the cardstock. Colour all the images with PrismaColor pencils. Antique the entire card, including the coloured images, with Tea Dye Distress Ink and a piece of scrunched up paper towel. 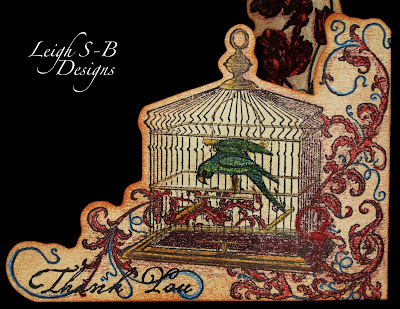 This gives the card a beautiful vintage warm glow. I love the look of this card, it's so striking and truly unique. 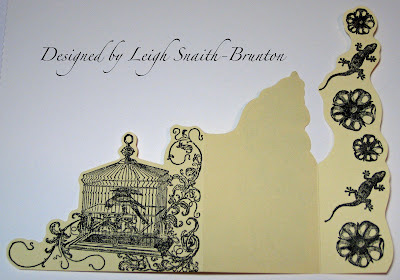 I hope I've inspired you to try your hand at some uniquely skinny cards too ;0) Here's some more views of my creation. FYI: some of the photos in this tutorial can be enlarged by clicking on them. I've got plenty more Blockheads Design Team creations in store for you! I'm thrilled to share that I will be designing for Blockheads up until the end of August for this current term AND the fun doesn't end then coz I've been invited to continue into a new term starting in September!! Woohoo! I'm so excited LOL! 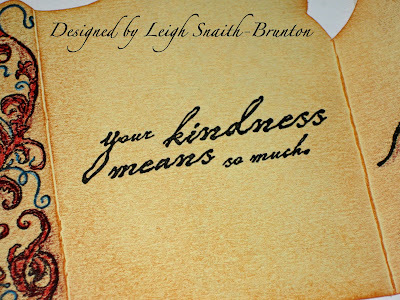 For my next Blockheads installment I've got a couple of ATC projects to share with you so stay tuned! 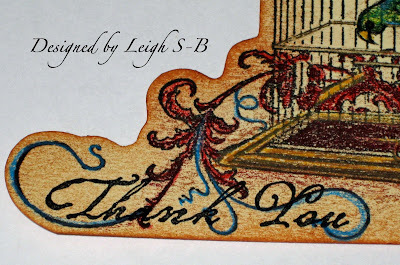 Don't forget to also check out the blog of my fellow Blockhead, Karen, for a fabulous Victorian Eccentricities tag featuring some of the same images I've just shared with you! Oh Leigh, this is just gorgeous. I love the results you get with the watercolor pencils-fabulous. 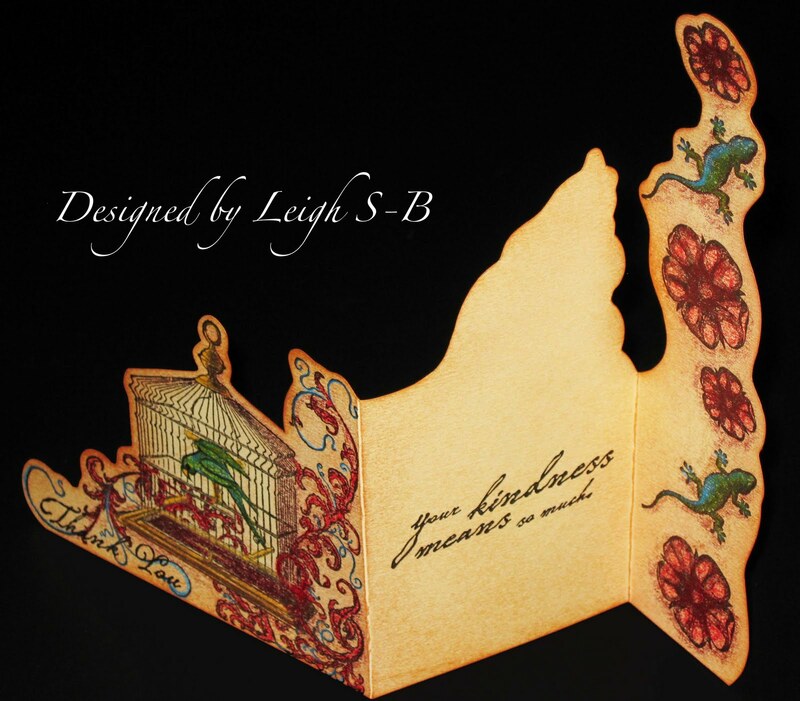 What a great idea - to let the images determine the shape of the card. I am going to try this! Thanks for the inspiration. 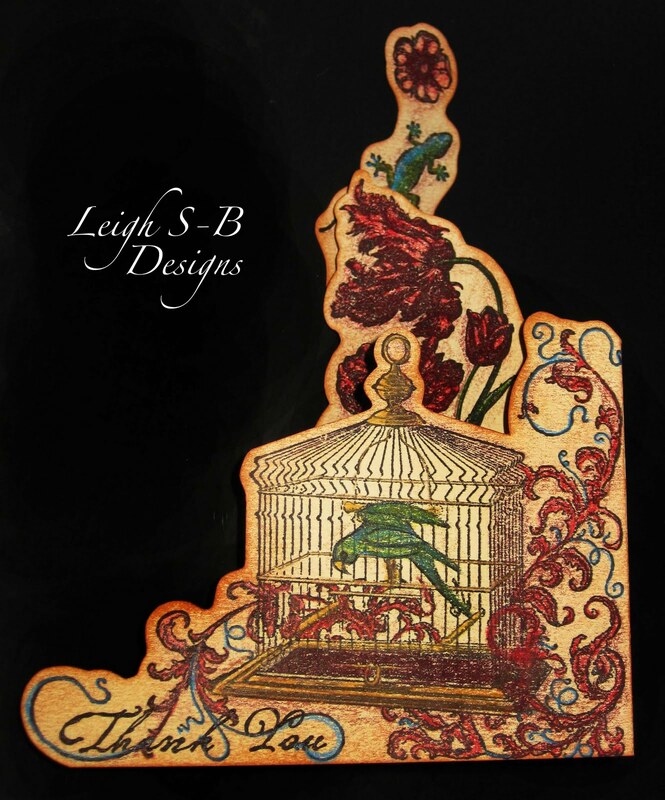 Oh Leigh, this is truly fantastic. I cannot believe just how talented you are in so many different ways. This definitely has to be my next card making session. Thank you so much for your generosity in sharing how to do.